The term ‘glaucoma’ refers to a group of diseases that impact the eye’s optic nerve, resulting in serious damage like vision loss and blindness. Most people develop glaucoma over time as fluid builds up in the front part of the eye, resulting in increased pressure and damage to the optic nerve. The good news is that glaucoma is very treatable with early detection. That being said, it is the leading cause of blindness in people over the age of 60. Glaucoma can occur at any age, but the majority of people who develop glaucoma are older adults. Unfortunately, there are no warning signs of glaucoma. This is why it is so important for you to come into First Eye Care for a comprehensive eye exam at least once per year. 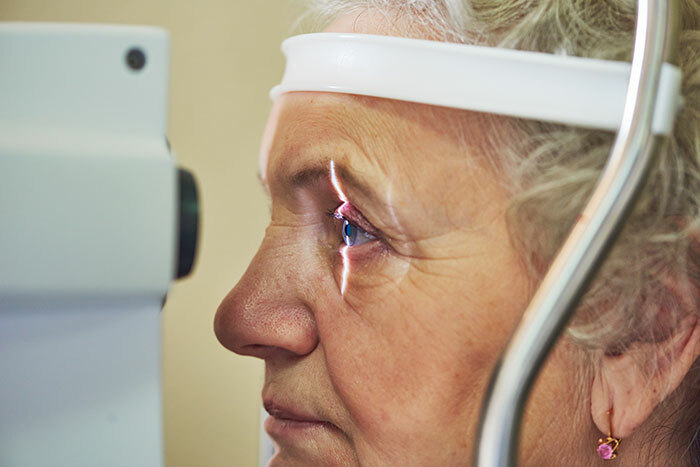 Glaucoma typically develops slowly over time, which means you may not notice any change in vision until the condition is at an advanced stage. Vision loss due to glaucoma cannot be recovered, which is why it is so risky to negate your eye health. Having regular, comprehensive eye exams that include measurements of your eye pressure is the best way to stop glaucoma in its tracks. If you develop glaucoma, you will more than likely require treatment for the remainder of your life. Primary open-angle glaucoma - This is the most common type of glaucoma and happens over time. With this type, the eye cannot drain fluid as it should, resulting in a buildup of pressure that damages the optic nerve over time. Angle-closure glaucoma - Also referred to as “closed-angle glaucoma” or “narrow-angle glaucoma”, this is the lesser common of the two and occurs when the iris is too close to the drainage angle of the eye, which can result in blockage. When the drainage angle is completely blocked, it is considered an acute attack and requires emergency attention. Either type of glaucoma can develop over time and require immediate medical attention. If you neglect your eye health and do not seek treatment for glaucoma, it will eventually lead to blindness. Glaucoma can be treated as long as we spot it early on, so please give us a call today to schedule an appointment. We have three convenient locations in Hurst, Keller, and Roanoke. Please visit one of these for more information on our comprehensive exams and how they can help stop glaucoma in its tracks.